This is painted in Oils on a 16" x 20" canvas. The subject is Riverside Park, on the outskirts of Southampton, Hampshire, UK. A very large, old Oak tree can be seen beside the River Itchen. 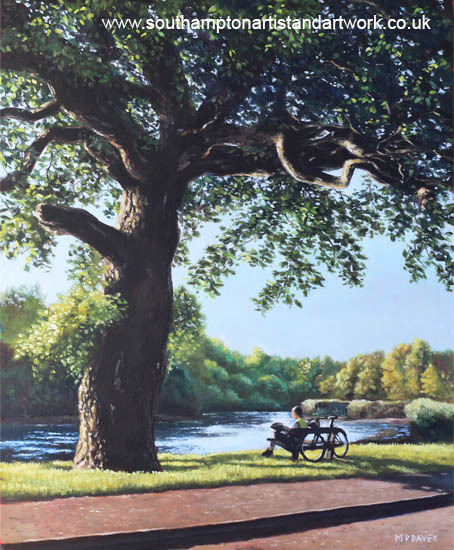 A cycle lane runes along the river bank and a cyclist can be seen resting on a bench, his bicycle resting against the tree. It is late afternoon and the light within the scene in soft and golden. The area is popular with canoeists and yachtsmen using the water, and families and friends walking through the park or fishing from the banks of the River Itchen.